I’ve been reading a book my mother gave me: Henri Matisse, A Retrospective by John Elderfield, (The Museum of Modern Art 1992). When I used to visit her she had a treasure trove of art books that I would read. She usually agreed to allow me to take one with me when I left. This was one she wanted to keep. Reading a big, heavy art book is an ordeal. There is the constant flipping pages to find Figures and Plates to which the text refers. When the artwork is reproduced in black and white in the book, I have to use my computer to look up the color version. I followed this advice today, closed my eyes, and remembered how I used to press my hand on my brother Mike‘s* chest when he was trying to slam it with his fist. My memory was visual. I reproduced it below. As I read further it became clear that Matisse was referring to artists who have their subjects in front of them. His point was to teach his students to create their subject anew on the canvas and make its color design internally balanced (i.e., not dependent on colors presented by the subject). This is only a tiny bit of information I absorbed today. I am not even sure if the bit I incorporated into my art was the one transmitted by Elderfield in his essay. And I strive for this. I’m so glad Mom eventually gave me her Matisse book. I’ve got a lot more to read. 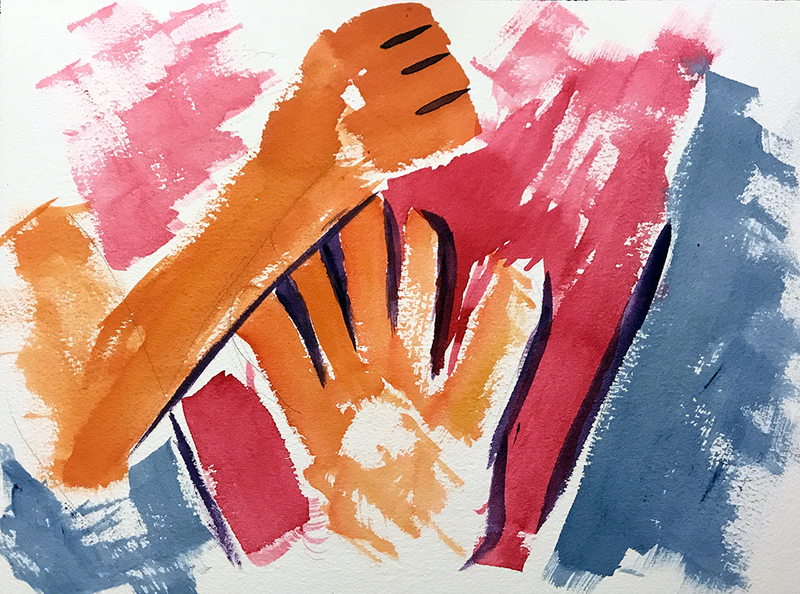 This entry was posted in Mike, Personal Stories and tagged abstract art, artistic process, autism siblings, creative process, Henri Matisse, John Elderfield, mental image, Paul Klee, philosophy, watercolor. Bookmark the permalink.